But especially in the last year I've become very wary of extra ingredients (either for flavor, color retention, or longer shelf life) that are added to storebought canned & jarred goods. I was reminded of this when I stopped by the grocery store today to pick up a few things for my husband who has a bad bout of the stomach flu. I looked at the jar of unsweetened applesauce and I noticed while it didn't contain added sugar, it did contain erythorbic acid, a type of ascorbic acid or in layman's terms: manufactured Vitamin C. A food additive used to preserve color in canned goods. Vitamin C is a really good thing. Especially when you are trying to build immune health! But to get Vitamin C in the form of an extremely processed food additive isn't the best way. I worry about how this additive was manufactured. What it was made from? Where did it come from? Will it be metabolized the same way that natural Vitamin C is in our body. I don't know. I looked at the jar of applesauce and decided I could do better than that. How hard would it be to go home and throw a regular apple in the blender and make a raw applesauce without any super processed additives? It wasn't hard at all. From now on when I need applesauce I won't be buying it in a jar. This was so easy to prepare and so delicious! So often we choose what we think is the faster way to make food. The easier way. The way that's most convenient. Yet, so often it can be just as easy & convenient to make at home. 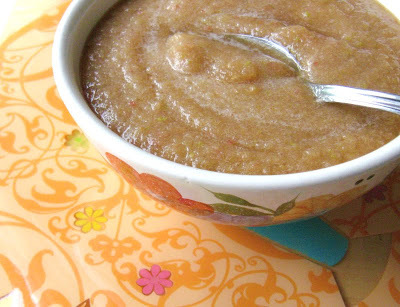 Voila... instant, raw, healthy, delicious, vegan, naturally sweet & gluten free applesauce! Free of gluten, dairy, soy, eggs, sugar, and a ton of other completely unnecessary things! Serve applesauce chilled with cinnamon sprinkled on top! **In a Vitamix you MAY be able to leave out the additional water needed to help blend the sauce. In my high-end (but not a Vitamix) blender, I needed the water to help break up the fruit and blend into a smooth consistency. Also, I just added this to my compilation page of recipes, if you don't mind. I'm new to the blogging world, and this is helping me keep track of all the tasty-looking concoctions I come across! Sounds perfect! I actually have some overripe bananas and kinda ignored apples right now. Gonna make this! How long will it last in the fridge, do you think? A few days? Maybe I'll freeze some. I've never thought to put banana in it! This is the perfect baby food, too, you know. C. LOVES applesauce! abby - I SO meant to put in a sentence or two saying that mom's everywhere have been making this forever! :-) lololol! I'm glad you pointed it out!! I love apples & bananas together! Tasty Eats - Yes! Definitely freeze it for longterm storage. I've had mine in the fridge for about 4 days and it is still very fresh, but I will probably freeze whatever I don't use today!